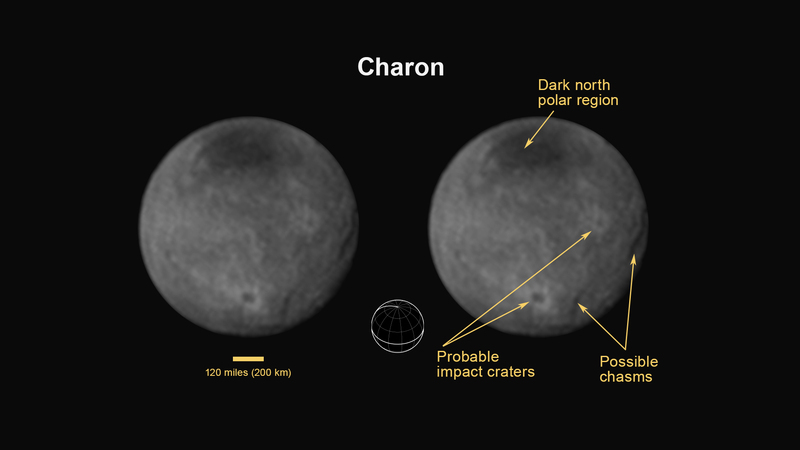 July 12, 2015 – New Horizons’ newest images reveal Pluto’s largest moon Charon to be a world of chasms and craters. The most pronounced chasm, which lies in the southern hemisphere, is longer and miles deeper than Earth’s Grand Canyon, according to William McKinnon, deputy lead scientist with New Horizon’s Geology and Geophysics investigation team. The most prominent crater, which lies near the south pole of Charon in an image taken July 11 and radioed to Earth today, is about 60 miles (96.5 kilometers) across. The brightness of the rays of material blasted out of the crater suggest it formed relatively recently in geologic terms, during a collision with a small body some time in the last billion million years. The darkness of the crater’s floor is especially intriguing, says McKinnon. One explanation is that the crater has exposed a different type of icy material than the more reflective ices that lie on the surface. Another possibility is that the ice in the crater floor is the same material as its surroundings but has a larger ice grain size, which reflects less sunlight. In this scenario, the impactor that gouged the crater melted the ice in the crater floor, which then refroze into larger grains. A mysterious dark region near Charon’s north pole stretches for 200 miles. More detailed images that New Horizons will take around the time of closest approach to the moon on July 14 may provide hints about the dark region’s origin. At 7:49 AM EDT on Tuesday, July 14 New Horizons will zip past Pluto at 30,800 miles per hour (49,600 kilometers per hour), with a suite of seven science instruments busily gathering data. The mission will complete the initial reconnaissance of the solar system with the first-ever look at the icy dwarf planet.